PANAMA CITY, July 17, 2009, Boeing and Copa Airlines yesterday announced an order by the Panamanian airline for 13 Boeing 737-800 airplanes, plus options for an additional eight. The order represents a mixture of option conversions and new orders and brings to 27 the number of Boeing Next-Generation 737s the airline has on order. Boeing Commercial Airplanes President and Chief Executive Officer Scott Carson and Copa Chief Executive Officer Pedro Heilbron announced the order during a ceremony today in Panama City. Panama President Ricardo Martinelli and Rafael Barcenas, Director General of the Panama Civil Aeronautics Authority, presided over the event, with other government officials in attendance. "Copa Airlines continues to be successful in a very challenging economic environment through the use of the latest in commercial aviation technology," Carson said during the ceremony. "With this order, Copa will be one of the early beneficiaries of Boeing's recently unveiled 737 performance improvement package." The airplanes also will be outfitted with Boeing's signature Sky Interior. Drawing from years of research used to design the interior for the 787 Dreamliner, the 737 Boeing Sky Interior features new, 787-style sculpted sidewalls and window reveals that provide passengers with a greater connection to the flying experience. 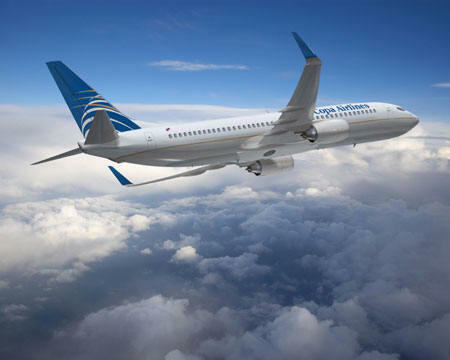 "The Boeing 737s have been a major factor in Copa's success, providing us with operating and cost efficiencies, and enabling us to offer our passengers world-class service and an extensive route network throughout Latin America," said Pedro Heilbron, CEO of Copa Airlines. "This aircraft order reaffirms our confidence in our business model and the growth potential of Latin American aviation." Copa operates from Tocumen International Airport, a time-saving hub on long routes between the United States, South and Central America, and the Caribbean. The airline flies four of the world's longest 737 routes from there - to Buenos Aires, Santiago, Sao Paulo and Los Angeles - thanks to the 737-800's exceptional range.